There is a special place in my heart for soul food. 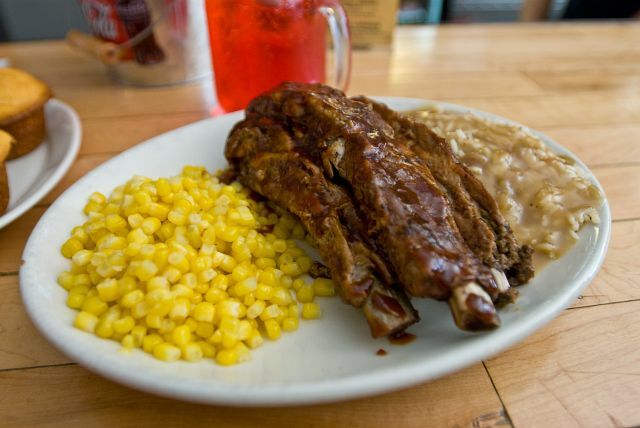 Thinking of the crunch of buttermilk fried chicken, melt in your mouth texture of braised ox tails, and succulent barbecue ribs makes my mouth water. 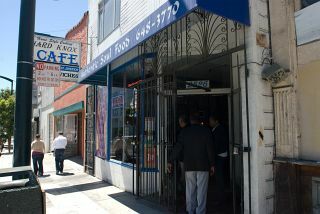 There aren't very many places in the San Francisco Bay Area that do an outstanding job at preparing soul food, but Hard Knox Cafe in San Francisco is definitely one of the best. Hard Knox Cafe is located in the Dogpatch historic district of San Francisco near the corner of 3rd and 22nd streets. Like many of San Francisco's restaurants, the front door (which is barred) is actually kind of easy to miss unless you're looking for it. 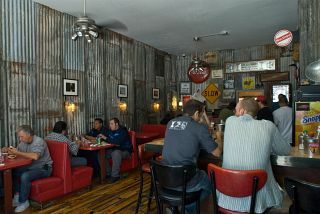 Inside, the cafe features walls lined with corrugated steel, a bar that seats about seven or eight people, and several four person booths with vinyl seats that are cracked or ripped due to age and use. When you spot an empty table, make a beeline for it and sit down. If you don't, there's a high probability that someone else coming in after you will move in and take the table. Don't wait to be seated, just go for it. Sandwiches and burgers can be had for about $6 to $8, but the real deals are the entrees that range from $8 to $13. All entrees come with two sides and a pair of corn muffins. After ordering, the first things that arrive are your corn muffins which are served piping hot. The crust nice and crunchy and the insides moist and flavorful. 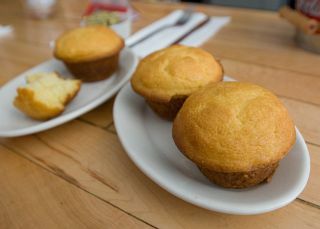 Sinking your teeth into these corn muffins makes you wish you could start every meal with them. My favorite sides to have are the corn and the rice with gravy. After tasting their fried chicken, Tina exclaimed that theirs was the best fried chicken she has ever had in her life. When she asked if I thought the same, I said, "Why do you think I brought you here?" Last time I showed up at Hard Knox, a little past noon on a Saturday, they had a breakfast menu that was available that I hadn't seen before. This allowed me to marry two of my favorite classes of foods - soul food and breakfast food. 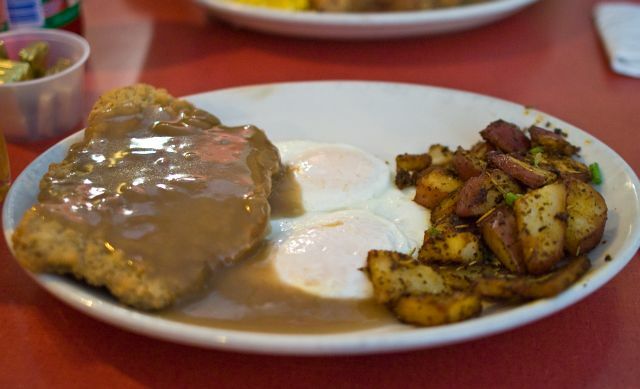 I ended up with a delicious country fried steak served with an incredible gravy (they refused to tell me what was in it except that it starts with homemade stock) that I paired with two eggs over medium and home fried potatoes. Although the eggs and potatoes were good, it's not in the same league as their classic entrees. 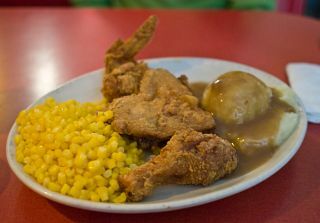 The food served at Hard Knox Cafe is so good that I don't really know what to say. If you get a chance to visit, I recommend ordering the fried chicken or the ox tails. 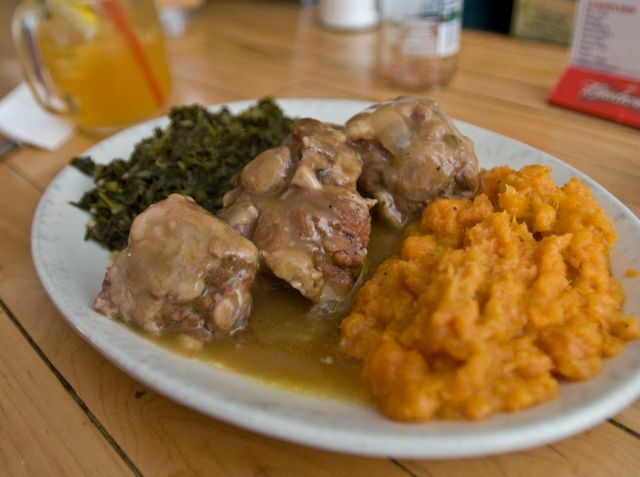 One thing to note is that the green vegetables will be cooked Southern style (way overcooked). Real good looking comfort food there. The country fried steak and eggs with homefries looks great. last time I was in the bay area my buddy took me to HardKnox. all I have to say is WOW. I had the ribs with an amazing bbq sauce, collard greens, and mashed sweet potatoes. All were amazing and I will definitely be going back! i bet i'll never go there - but how fascinating to get a look at this restaurant and its offerings. thank you very much! I've been there three times and it is definitely one of my favorite restaurants. I would highly recommend it to anyone who will be in the Bay area. Great pics! I once saw this featured on "Pacific Fusion" with Brook Lee. The oxtails looked so good I recorded the episode. I wanna go on my next SF visit! Subject: I love Hard Knox! The cornbread, mac n cheese, and red beans and rice are the BEST. I thought the fried chicken was ok but the short ribs are awesome! Go there as soon as possible if you live anywhere near by. Well, if this wasn't a great tip! I recently returned from a Stateside trip (including Sanfra, NV and UT) with my loved one and this was the one place I told her I wanted to go to while in town. Being herself a good food lover, she had no qualms about it. Just a few minutes after taking place at one of the tables we had hot cornbread in front of us and it filled up the air with a heavenly fragrance. It was hard not to gobble it at once, but we opted for smaller chunks and savored it slowly. I never visited the Southern states, so I can't say if they have better, but this is the yardstick every other cornbread I'll taste will be measured against. Portions are, as always in America, sizeable and it wasn't easy to get to the end but -considering what was in our dishes- we would've felt like criminals if we didn't clean up the plates. The entrees were excellent: juicy and crispy chicken and perfectly cooked ribs, but the sides were out there, especially the yams and mashed potatoes. ANd I could swear that gravy comes directly from Heaven's kitchen. Once again, Cooking For Engineers proved to be an invaluable resource: thank you and keep up the good work. really? I've only gone there once and wrote it off as some of the worst cooking I've ever had. . . Most items were beyond overcooked and the greens were of seriously low quality. Maybe I hit a bad day or something? I've had subpar fried chicken there once when I showed up late in the afternoon and the frying oil was "tired" enough that everything was a little burnt. It's best during "normal" hours. I suspect you hit a bad time and suggest you try it again. All my other meals there were excellent.